Beautiful hardwood frames call attention to customer information! This distinctive wall frame has a strong maple frame. Anchors to wall with four screws (not provided). 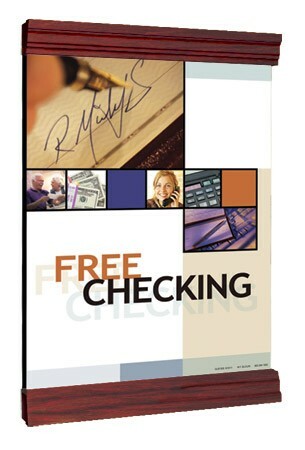 Accommodates 22"w x 28"h poster. Available in natural, cherry, mahogany, and black finish. A stylish look featuring highly polished clear acrylic faceplates with brushed stainless stand-offs. 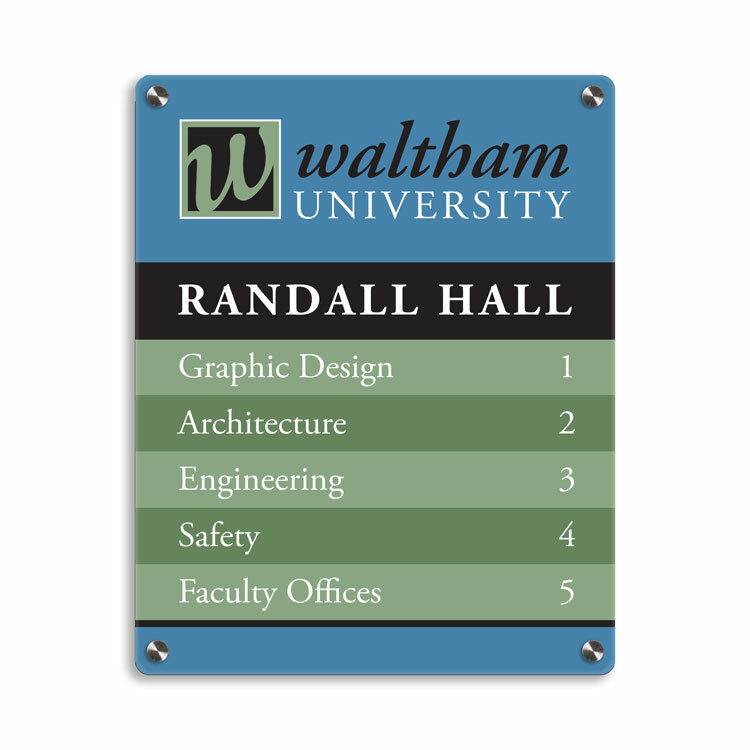 • Use for way-finding, directories, identity signage, and more. Elegant hardwood wall frames with beautiful top & bottom accent trim. 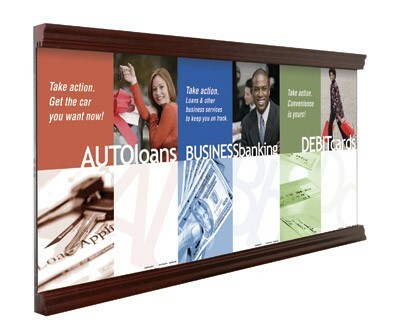 Use this wood poster frame to display your current promotions and services in your customer areas. Clear non-glare acrylic faceplate and mounting hardware included with each frame. 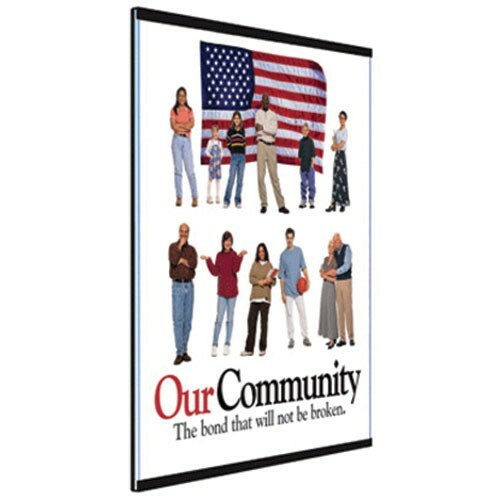 Accommodates 22"w x 28"h posters Available in natural, cherry, mahogany, and black finish. Detailed moldings distinguish these frames to provide a traditional look to your lobby or office. Available in 5 finishes. 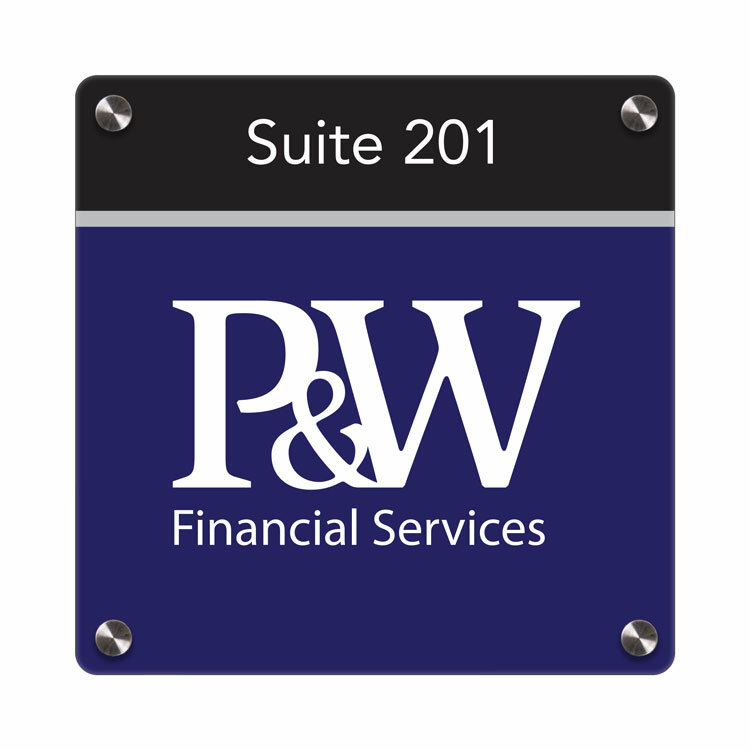 Windsor wall frame fits graphic inserts 22"w x 28"h and includes (1) non-glare faceplate. Overall dimensions: 24-1/2"w x 32-1/4"h x 2-3/8"d.
High quality craftsmanship! This convex wall frame showcases 22"x28" inserts and is hand crafted from solid hardwood. Choose from 4 finishes. 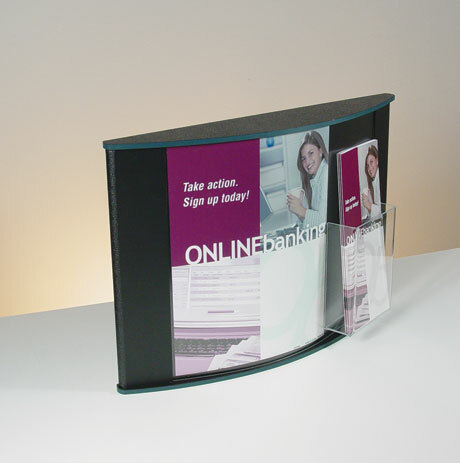 Comes complete with a clear acrylic faceplate and mounting hardware, as well as a 4 pocket brochure holder. Available in light oak, cherry, mahogany, golden oak and black finish. 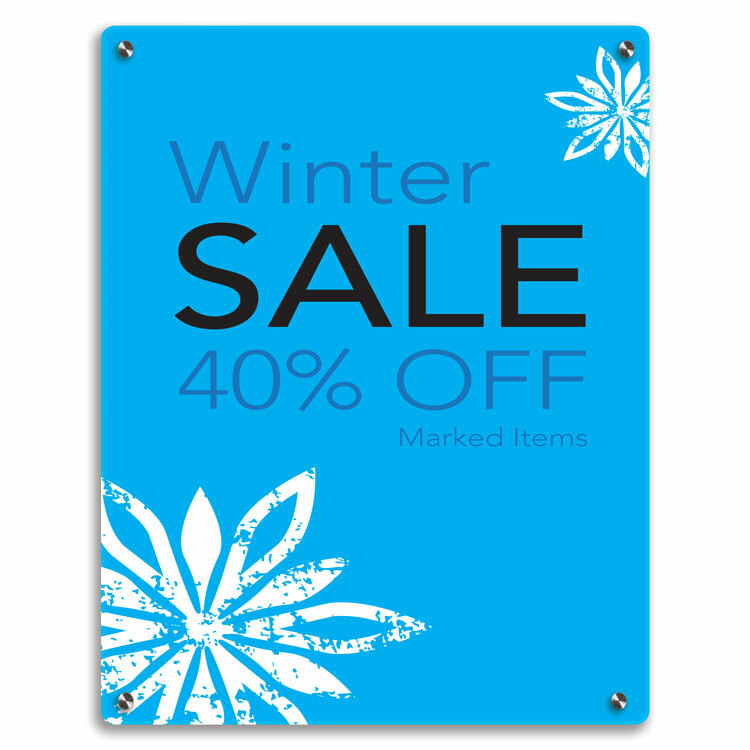 Durable Sintra poster frame for 22" x 28" poster. Poster easily slides in through the side of the poster holder. Includes non-glare acrylic faceplate and 4" header. 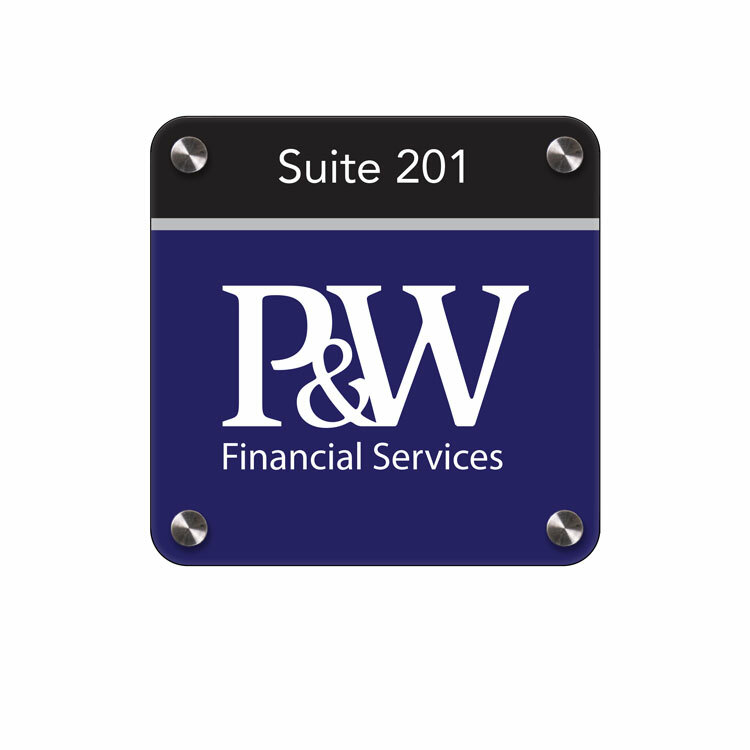 Brand your company logo on the header for brand recognition! 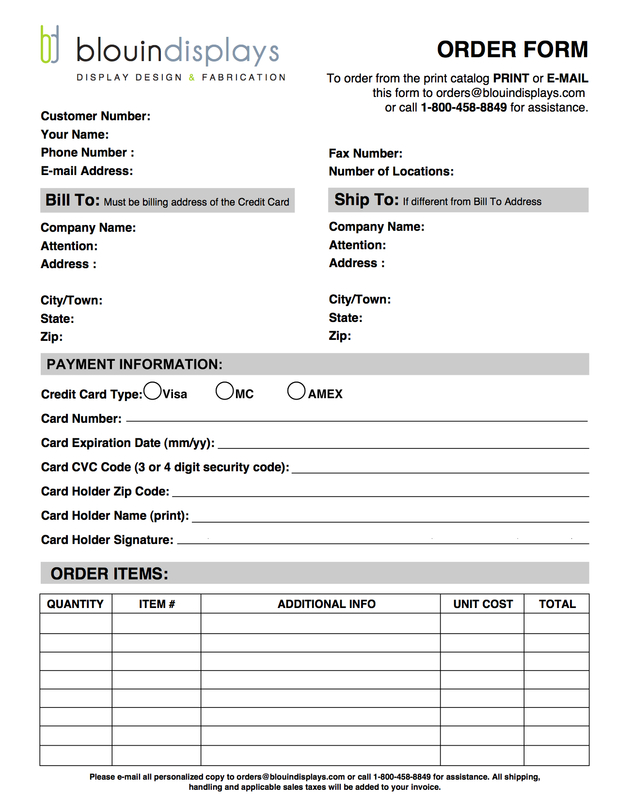 Typeset fee applies. Mounting hardware included. Detailed moldings distinguish these frames to provide a traditional look to your lobby or office. Available in 5 finishes. 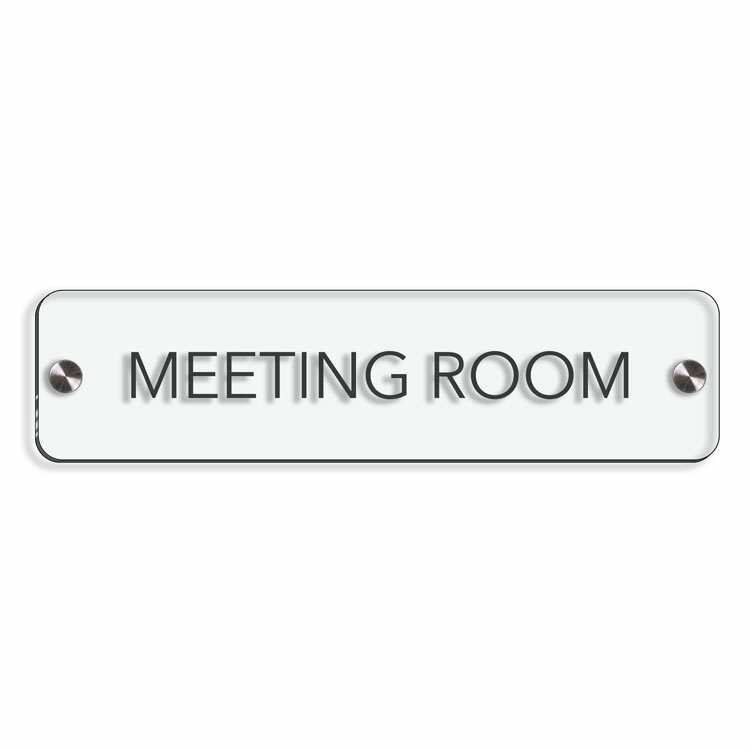 Windsor wall frame fits graphic inserts 24"w x 36"h and includes (1) non-glare faceplate. Overall dimensions: 26-1/2"w x 40-1/4"h x 2-3/8"d.
High quality craftsmanship! 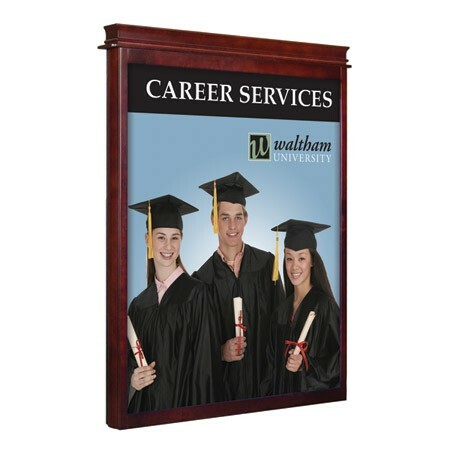 This convex wall frame showcases 22"x36" inserts and is hand crafted from solid hardwood. Choose from 4 finishes. 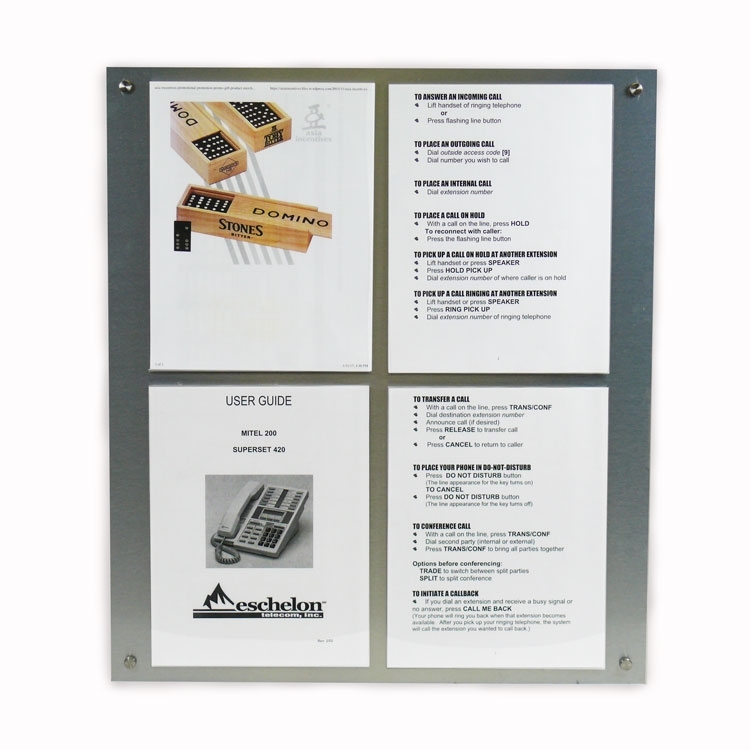 Comes complete with a clear acrylic faceplate and mounting hardware, as well as a 4 pocket brochure holder Available in light oak, cherry, mahogany, golden oak and black finish. 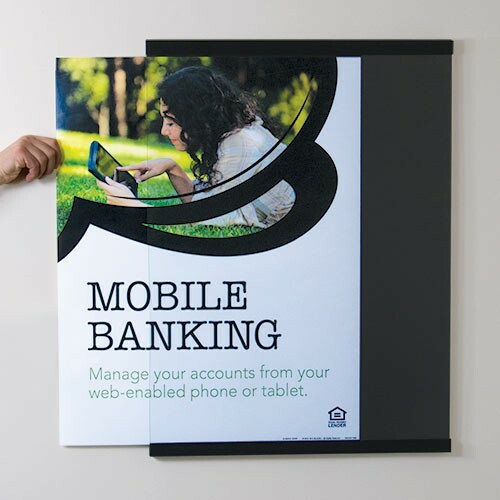 This durable, low profile metal poster frame is a sleek & contemporary way to promote your products & services. 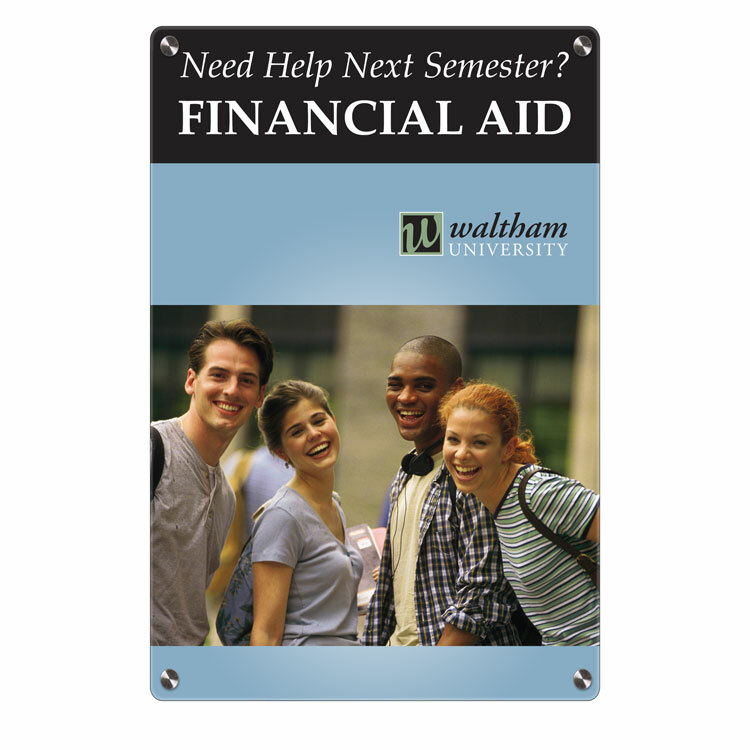 Each black poster frame includes hardware for sheet rock installation, as well as a non-glare faceplate. 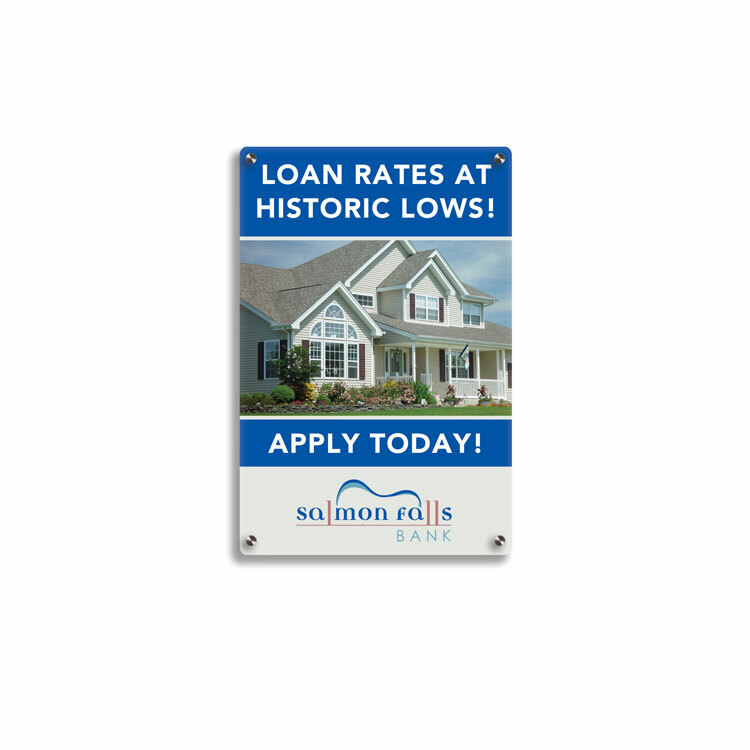 Aluminum Stand Off Sign Holder - holds 4 - 8.5x11 signs. Standoff keep aluminum posted off wall for a very clean and professional look. Sign can easily be changed by lifting sign forward to insert and take out literature. 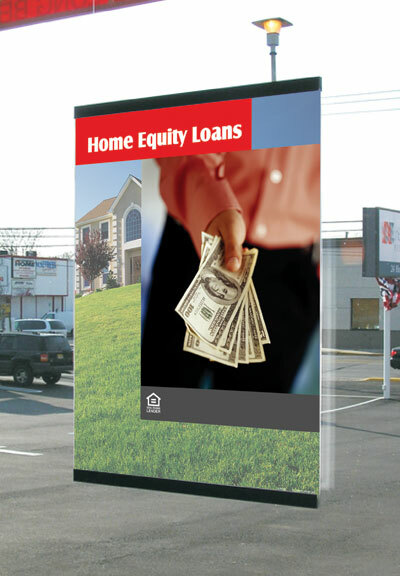 Contemporary Wall frame for posters and graphics features black side rails. 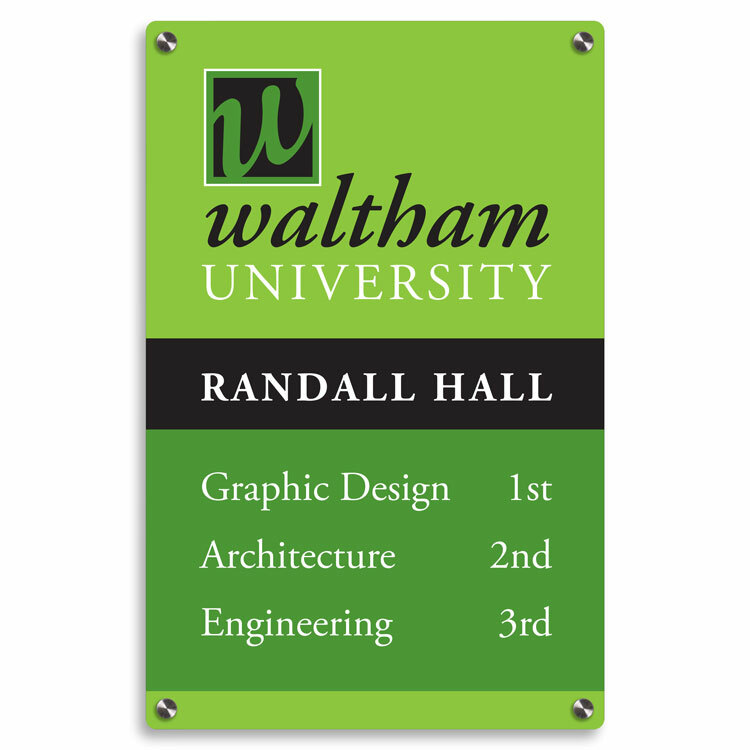 Contemporary Wall frame fits graphic inserts 24"w x 36"h. Overall dimensions: 25-1/8"w x 36-1/2"h x 2-1/2"d.
Contemporary Wall frame for posters and graphics features black side rails. 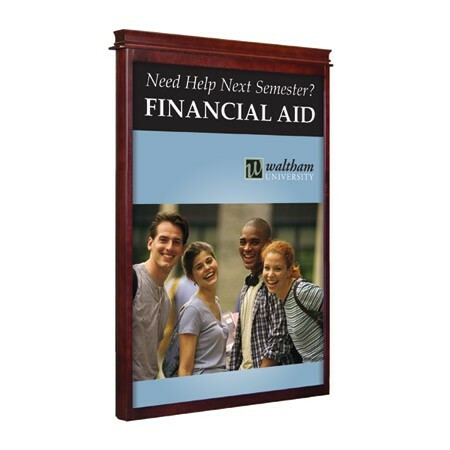 Contemporary Wall frame fits graphic inserts 22"w x 28"h. Overall dimensions: 23-1/8"w x 28-1/4"h x 2-1/2"d.
Durable Sintra 22"w x 28"h frame with 5-Pocket literature dispenser. Side loading. Complete with faceplate. 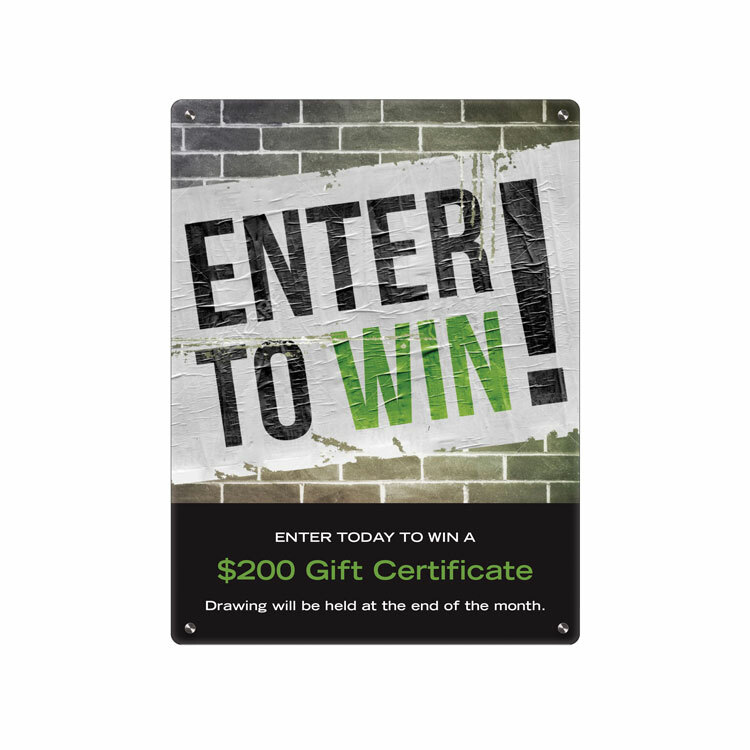 Wall poster frame for 22x28 posters. 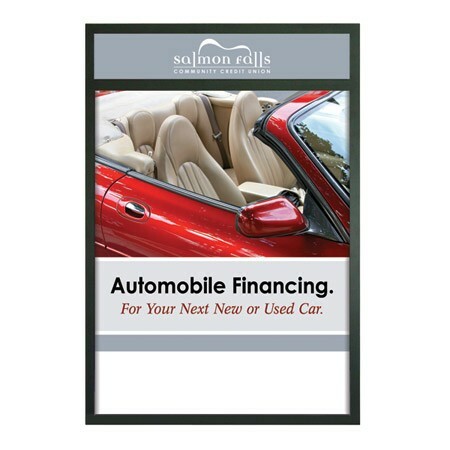 This poster frame features a non-glare faceplate with top & bottom accent strips available in multiple finishes to match any decor. 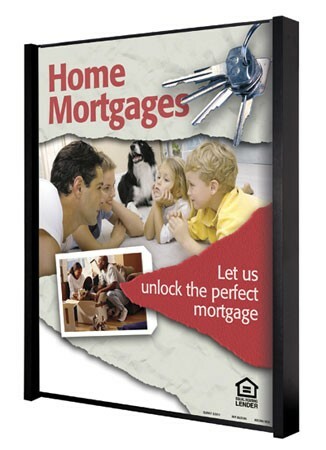 This value packed wall frame is visually appealing & easy to install. Black enameled steel box style frame (.5"d). Non-glare acrylic faceplate attaches magnetically. Top & bottom 1" trim accents, Quality materials for longevity. Includes wall mounting hardware. Elegant hardwood wall frames with beautiful top & bottom accent trim. 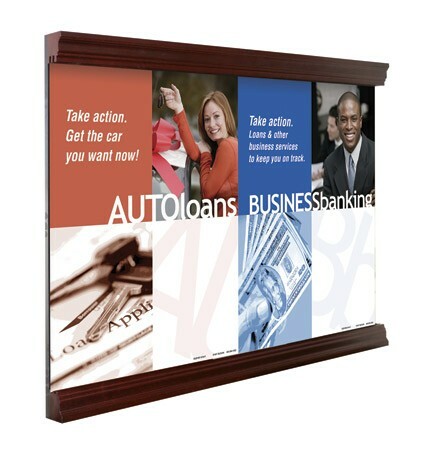 Use this wood poster frame to display your current promotions and services in your customer areas. Clear non-glare acrylic faceplate and mounting hardware included with each frame. 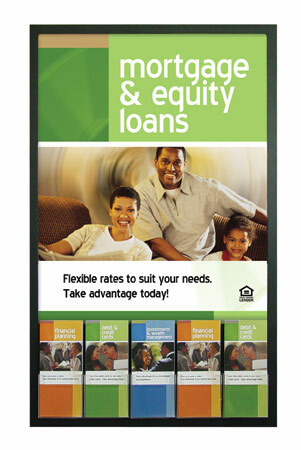 Accommodates (3) 22"w x 28"h posters Available in natural, cherry, mahogany, and black finish. 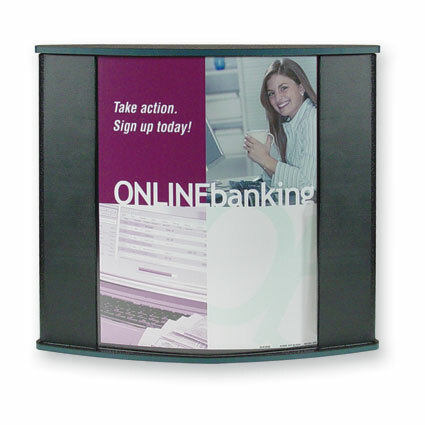 Durable Sintra 24"w x 36"h frame with 5-Pocket literature dispensor. Side loading. Complete with faceplate. 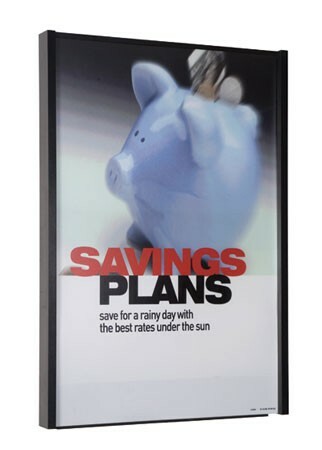 The 1" black trim accents give this ceiling hung poster holder a clean & professional appearance. 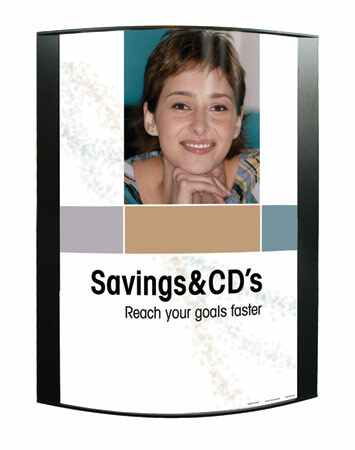 Posters easily slide between (2) 1/8" clear acrylic faceplates. Complete with hanging hardware kit. 30x40 shown. Elegant hardwood wall frames with beautiful top & bottom accent trim. 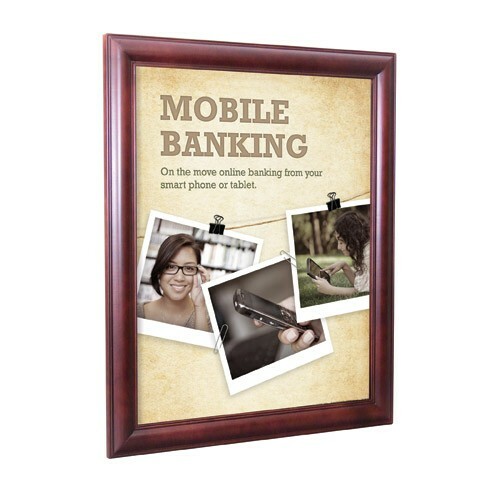 Use this wood poster frame to display your current promotions and services in your customer areas. Clear non-glare acrylic faceplate and mounting hardware included with each frame. 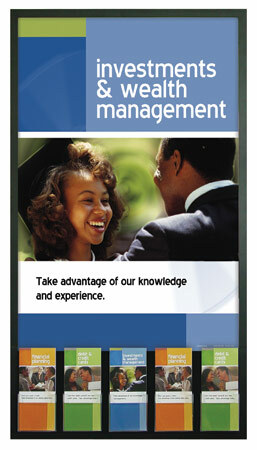 Accommodates (2) 22"w x 28"h posters Available in natural, cherry, mahogany, and black finish. About Us At Blouin Displays, we'll work together with you to design and fabricate the ideal display for your specific needs and unique situation.